This weekend was a deadly one for Metro riders as two people were struck by trains in separate incidents. 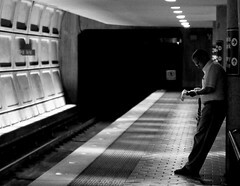 The first took place on Saturday at the Potomac Ave station when a man was run over on the orange line. He was alive when rescue workers arrived but later succumbed to his injuries. The second incident occurred on Sunday at Bathesda where a women intentionally jumped in front of a train. Both deaths delayed service for several hours as police investigated.